The reality you face in healthcare is that sensitive electronic information is everywhere – especially on your laptops and mobile storage devices. When these systems are lost, stolen or otherwise mishandled the tangible and intangible costs to your healthcare business can be enormous. According to the 2012 HIMSS Analytics Report, 27 percent of respondents had a security breach in the past 12 months with 69% reporting more than one breach. Whether you work for a healthcare provider or one of the numerous other entities and business associates working in and around the healthcare industry, one seemingly small mishap can create big problems with the business. Certain products are available in FIPS 140-2 Level 2 CERTIFIED versions. Our certificate number is 1860. CMS’ CE Secure™ family of flash drives and external hard drives, along with CE Secure™ line of hardened, tamper-evident flash drives, lock down sensitive data with an on-board, hardware encryption engine that puts a military-grade, AES-256 wall between unauthorized users and the drive’s contents. The security protections built into CMS’ encrypted USB drives are rough and tough. And by choosing from an array of scalable, intuitive platforms for establishing and policing your employees’ use of CE Secure™ drives, you can ensure that mobile employees are using strong passwords and taking other measures to take full advantage of those capabilities. From a central console, set policies for passwords, application use, recovery, and more – across a handful of drives or thousands of them. Depending on the CMS solution you deploy, you can also manage and update device drivers and applications, administer identity protection features, and create whitelists of approved IP addresses to control where devices and applications can be used. And if a drive is lost or stolen, you can even remotely erase it or destroy it. Power outages, severe storms, earthquakes, fires – any of these might usually impact your ongoing operations. But CMS’ secure mobile storage and portable workspace solutions help keep workers productive even when they can’t make it into the office. There’s no need for employees to install drivers or other software to securely access their stored data, workspace or applications. CMS drives come pre-loaded with everything users need, and they leave no trace on the host PC. In addition to the combined safeguards of encryption, multi-factor authentication and hardened enclosures, some of CMS’ enterprise-class mobile storage solutions come with anti-virus and anti-malware protections, either as a standard feature or as an option. When a mobile employee’s digital identity is compromised, your network, your applications, and your data all become vulnerable. That’s why CMS offers strong, multifactor authentication on CMS CE Secure drives. And for users of CE Secure™ drives, CMS offers enterprise-class identity management capabilities – combining Public Key crypto services, strong password authentication and strong password management – to shield identities out in the wild. Only CMS integrates these sophisticated protections with encrypted storage in a single mobile device. Mobile data security involves more than just locking down data. Workers need the flexibility of working from any PC, and they get it with CMS’ portable workspace solutions. These solutions, available on CMS’ encrypted USB flash drives and hard drives, add another dimension to mobile security by enabling employees and contractors to safely work from any computer – at the office, at home, or on the road – Hardware encryption and strong authentication keep confidential data where it belongs. Complying with data security mandates doesn’t have to be a headache. Use CMS’ advanced reporting and auditing capabilities to document how, where and when users have accessed, saved or modified confidential data. And for maximum flexibility, CMS offers you both premise-based management solutions (when device management must reside behind your firewall) and cloud-based management solutions (eliminates the need for capital investments in servers and other hardware). CE Secure DiskVault encrypted hard drives are industry standard OPAL based self-encrypting hard drives. These encrypted hard drives can easily be integrated into an enterprise encryption management system that supports OPAL compliant encrypted hard drives. These management systems can easily enable the security features and handle the key management. The CE Secure DiskVault is an OPAL 2.0 compliant external USB 3.0 AES256-bit hardware encrypted hard drive. Weighing only 7 ounces, the CE Secure DiskVault is bus powered for easy transportability. Comes complete with USB 3.0 cable making the device ready to use immediately. The CE Secure DiskVault is ready to use right from the box. The encrypted hard drive is protected with “Always On” AES256-bit encryption and can be easily and quickly deployed into a managed environment with setup to ready to use times in minutes instead of hours for software encrypted devices. CE Secure DiskVault Traveler encrypted hard drives are industry standard OPAL based self-encrypting hard drives. These encrypted hard drives are ready to use right from the box, the first time you plug the encrypted hard drive in you are prompted to create a password. Once you have created a password the CE Secure DiskVault Traveler is ready to secure your data. The CE Secure DiskVault is ready to use right from the box. The encrypted hard drive is protected with “Always On” AES256-bit encryption. 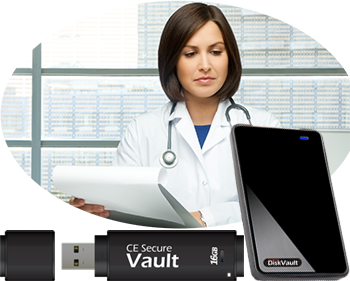 For greater security CE Secure DiskVault Traveler has the capability of adding an Administrative password, ideal for small medical offices, and small businesses so that data is kept secure.